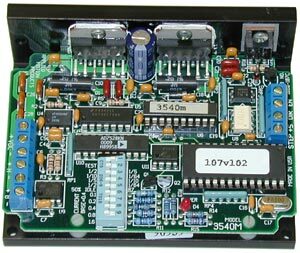 The 3540M step motor drive is a microstepping, bipolar stepper drive for step & direction applications. There are multiple step resolutions to choose from, and custom resolutions are available for OEM applications. Step resolutions and motor current are set via on-board dip switches, and the 3540M includes an idle current reduction feature to reduce motor current to 50% at standstill. A self-test feature is also included that automatically rotates the motor 1/2 revolution back and forth, which can aid in system setup and troubleshooting. The 3540M is compatible with a variety of 2-phase stepper motors.